Die Autorinnen sehen computational participation als eine Erweiterung von computational thinking u.a. weil heute in Gruppen und nicht mehr alleine programmiert wird und weil heute nicht mehr auf der grünen Wiese bzw. mit dem leeren Bildschirm, sondern aufbauend auf bisherigen Programmen / Bibliotheken programmiert wird. 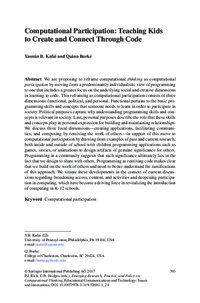 We are proposing to reframe computational thinking as computational participation by moving from a predominantly individualistic view of programming to one that includes a greater focus on the underlying social and creative dimensions in learning to code. This reframing as computational participation consists of three dimensions: functional, political, and personal. Functional pertains to the basic programming skills and concepts that someone needs to learn in order to participate in society. Political purposes capture why understanding programming skills and concepts is relevant in society. Last, personal purposes describe the role that these skills and concepts play in personal expression for building and maintaining relationships. We discuss three focal dimensionsâ€”creating applications, facilitating communities, and composing by remixing the work of othersâ€”in support of this move to computational participation by drawing from examples of past and current research, both inside and outside of school with children programming applications such as games, stories, or animations to design artifacts of genuine significance for others. Programming in a community suggests that such significance ultimately lies in the fact that we design to share with others. Programming as remixing code makes clear that we build on the work of others and need to better understand the ramifications of this approach. We situate these developments in the context of current discussions regarding broadening access, content, and activities and deepening participation in computing, which have become a driving force in revitalizing the introduction of computing in K-12 schools.